n a large bowl, add alligator meat, and toss with Jay’s Blackening Mix. Add canola oil to the skillet, and carefully add alligator in batches. 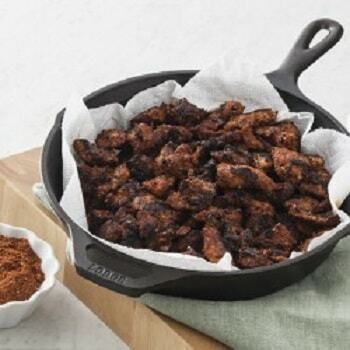 Let cook until meat is blackened and releases easily, 2 to 3 minutes. When it releases, turn each piece, and cook 1 to 2 minutes more. Remove alligator from the skillet, and serve hot with white rémoulade. Seasoning Mix: In a medium bowl, combine all ingredients. Store covered for up to 1 year.